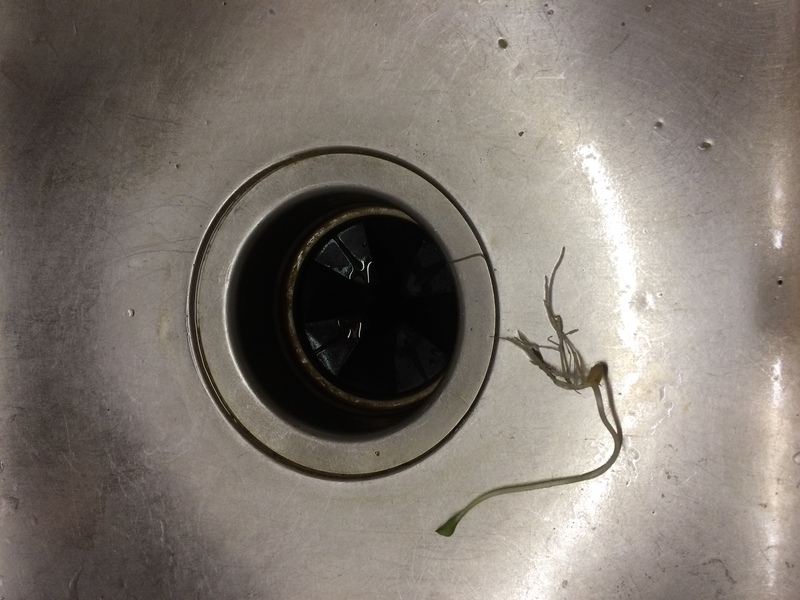 While spiffing up the kitchen a bit, I noticed a stringy something about 2 inches long coming up from the mouth of the garbage disposal opening. Thinking it was a left over corn silk from the steamed vegetables we had prepared earlier, I grabbed it to pick it out and throw it in the trash. It offered a little resistance when I removed it, which got my attention, and when I looked closer I saw that it was a seedling with a root system that had started growing in the folds of the mouth of the disposal. We ventured that the seed we were looking at was either a cucumber seed or a spaghetti squash seed, both of which was used in the preparation of an earlier meal. Barbara suggested that I plant it, which I did, and we are watching its daily growth so we can see exactly what brave seed it was that took root where it was planted to bring nutrition and life into the world. Freedom and liberty is a precious fruit that has been obtained with a very high price. We are enjoying the fruit of the men and women who have bravely taken root where they were planted to fight for and bring the life to us that we enjoy on a daily basis. They laid their life down for us. This Memorial Day we can all remember what they and their families endured for the high privilege we all share. We can be thankful to God that we have the liberty and freedom that we now have, and we must pray for our leaders that they have the wisdom from God to guide this great nation into continued freedom. Jesus laid his life down that we might go free. Sin is a deceitful taskmaster. It will cause everything to seem okay in everyday life, and blind your eyes to the eternal spiritual life. In all of life, God wants us to enjoy his peace and freedom. We have that by faith in Jesus. We are like that little seed perched on the mouth of the disposal. When the waters of life wash us on down and the switch is flipped, it is then forever too late. Now is the time to take Jesus. God sees eternal value in and has honored the life of every person by giving Jesus for us. In Jesus He provided the remedy for sin so that every person could live in his life, love, and liberty both here and hereafter. This Memorial Day we can remember Jesus and all the brave soldiers who have laid their lives down for our freedom here and hereafter.